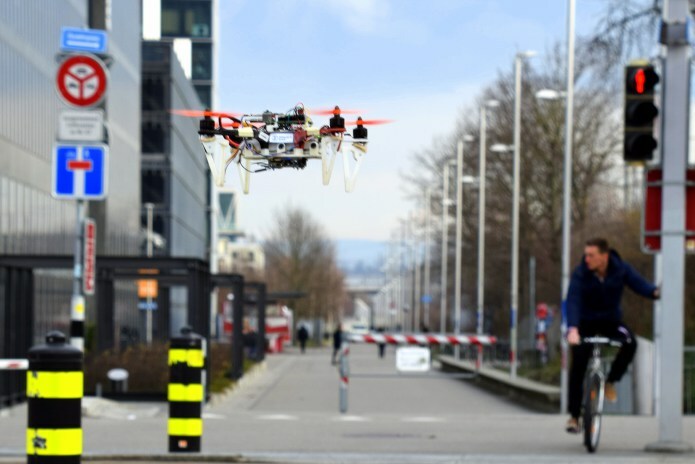 An algorithm developed by researchers at the Swiss Federal Institute of Technology (ETH) Zurich aims to help drones practice safe behavior in complex urban scenarios. Scientists at the University of Zurich have christened the algorithm that will in future enable safe drone flights in densely populated and heavily frequented environments DroNet . The unmanned autonomous aircraft will apparently learn from the data collected during car and bicycle rides through the cities. In doing so, they pick up both traffic rules and reaction patterns that allow them to face unknown situations, obstacles and other risks. Drones could have numerous potential applications in the future – especially in major cities. According to a report by the newspaper FAZ , the police in Hesse are currently testing the use of drones for preserving evidence and monitoring traffic accidents. Although the use of drones to deliver goods has also been discussed time and again, it presents particular challenges in big cities.